This high temperature, heat and flame resistant fiberglass gasket rope has a stainless steel wire mesh core. 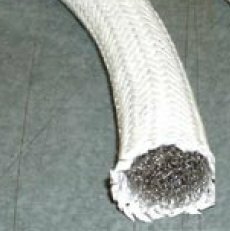 This rope is fabricated from high quality type E fiberglass that will not burn and will withstand continuous exposure to temperatures of 1200°F / 648°C. This high temperature rope is used as a gasket or seal with excellent compression resistance. This version of the rope has a smooth braided shell made from filamant fiber yarn, providing an extremely clean and free of loose fiber outer shell, especially suited for applications such as paint shop booths where loose fibers are not tolerated, such as automotive assembly.